The healing center at Samata welcomes you. In Sanskrit, ‘Samata’ means the state of equilibrium and balance. The core intention of our healing center is to support you in realizing your innate samata. With our experienced staff of practitioners, we offer a wide variety of therapies, expert guidance, and an extensive herbal pharmacy to ensure your true wellness and enduring balance. The ancient medicinal lineages represented at Samata are based on a deeply holistic view of life and health. This ideal, called ‘swastya’ in Ayurveda, is the discovery of the unique nature of a person’s body, mind, and spirit, and ensuring an empowered optimal balance of these facets. For support regarding specific health issues or nourishing your life in general, we offer consultations with practitioners of Chinese, Tibetan, and Ayurvedic medicines. This can include traditional diagnostics, immediate treatments, and a protocol comprised of guidance in diet, lifestyle, herbs, and continued therapies. Treatments during a session can include various forms of massage, acupuncture, and other classical body therapies. 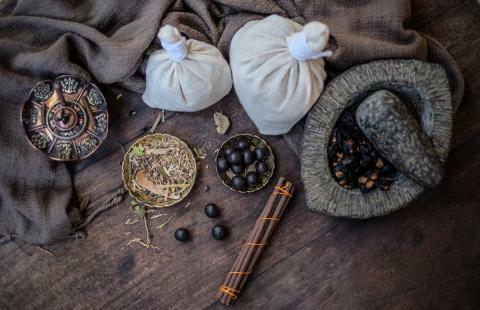 One may also receive Tibetan and Ayurvedic herbs from our pharmacy. Many of the treatments offered in the Samata clinic can also be experienced outside the context of a full consultation by simply choosing a therapy from our clinic menu.